The estimated two million dead fish found floating in the Chesapeake Bay in Maryland recently are not another sign of the apocalypse, but were instead probably killed by the cold weather, officials told The Baltimore Sun. Water quality was also ruled out as a possible culprit for the mass die-off of mostly spot and some croaker fish, the Sun reports. Spot fish are notorious for being vulnerable to the cold, and large winter kills of spot have been documented in Maryland at least twice before, a Maryland Department of the Environment spokeswoman told the Sun, with about 15 million dying in early 1976 and a smaller number in 1980. The mass Chesapeake fish die-off joins a growing list of reports from around the globe of mysterious fish and bird deaths. Brazilian authorities also reported recently that fishermen found several tons of dead fish, sardines mostly, near the port of Paranagua, reports the website Mediaite. Authorities there are investigating the reason for the deaths. In New Zealand, Fisheries officials are investigating the death of hundreds of snapper near Coromandel Peninsula beaches, reports the daily New Zealand Herald. 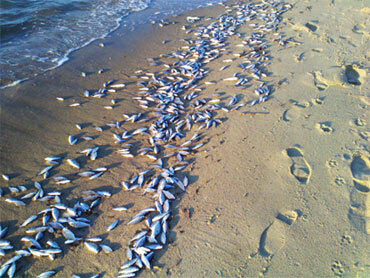 Beachgoers found the fish - many with their eyes missing - dead on the sand.